Leading supplier of explosion proof and industrial grade lighting Larson Electronics announced the release of a Solar Powered Generator with a Pneumatic Light Tower Mast. 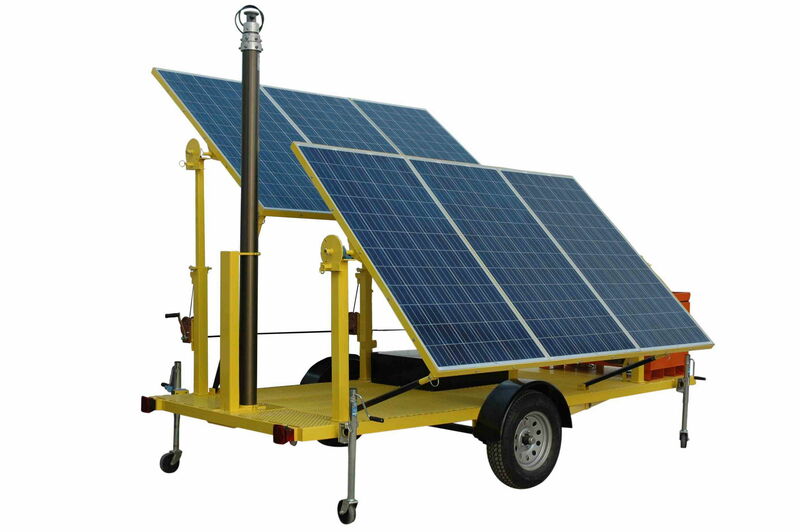 This solar light tower includes 6 solar panels, a solar charging system, battery bank and pneumatic mast mounted on a trailer with outriggers and a removable tongue. The SPLT-1.8K-400A-30 is a 1.8KW solar generator system that replenishes 200 amp hours of usable battery capacity per day. This system delivers 24 volts for lighting, cameras, sensors or other electronic equipment mounted atop a 30 foot collapsible, pneumatic mast. This unit is comprised of six 30-watt solar panels, generating a total maximum output of 1.8 KW. The panels are mounted to a rotating axis assembly. The panels can be rotated until they face inwards, which protects the panels during transport. When deployed, the panels are rotated until they face upwards. As part of the deployment, operators will set the four outriggers into position by pulling them out and pinning them into position. In this 24 volt system, each panel is terminated with a fused combiner box with a single lever action cut-off switch. With the switch set to the ‘on’ position, the combiner box passes power to the 80 amp capacity Outback Extreme charge controller. The charge controller charges a 400 amp battery bank. This 24 volt battery system is comprised of eight 6 volt batteries tied together in series and parallel. The battery bank cannot be drained below 50% without destroying the batteries. With that in mind, this effectively reduces the total capacity of this system to 200 amps at 24 volts. The trailer itself houses a built in wire raceway that brings power from the component control center and batteries to the light mast. At the base of the light mast there is an access panel for making connections form the power source to the cabling within the pneumatic mast. The pneumatic mast reaches 30 foot in height via the use of a low voltage air compressor located in the job box. The compressor is equipped with a pressure switch that maintains the pressure within the mast. When it is time to take the mast down for transport, the operator simply releases the pressure switch and the mast will slowly release pressure and lower to its full collapsed height of 8.25 feet. Larson Electronics carries an extensive line of LED light towers, portable distribution systems, explosion proof lights, portable work lights and industrial grade LED area lights. You can view Larson Electronics’ entire line of lighting by visiting them on the web at www.larsonelectronics.com. You can also call 1-800-369-6671 to learn more or call 1-903-498-3363 for international inquiries.